(15/P29) TRENTON – The New Jersey Tree Recovery Campaign, a partnership between the Department of Environmental Protection’s State Forestry Services and the non-profit Arbor Day Foundation, is distributing some 130,000 free tree seedlings to residents through 178 locations across the state, Commissioner Bob Martin announced today. 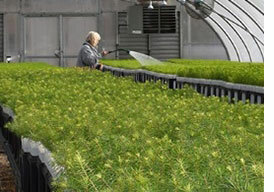 State Forestry Service’s New Jersey Forest Nursery is providing seedlings from more than 38 different tree species for the campaign after a hugely successful seedlings distribution effort last year. The species include a wide range of trees, from oaks to dogwoods and maples. Districts, Sustainable Jersey, Arbor Day Foundation, Brothers International, BJ’s Wholesale Club, Wyndham Vacation Resorts, and FedEx. The State Forestry Services’ Forest Tree Nursery opened in 1982 in Jackson, where foresters grow 500,000 trees annually. The nursery sells the majority of trees in packets of 100 to private landowners, including non-profits and New Jersey landowners who use the trees to reforest their land. Packet prices start at $30. The nursery also offers the Third Grade Tree Team program where each third grader in the state is eligible to receive a free tree seedling when requested by the student’s school. For Arbor Day celebrations, the nursery offers 98 tube seedlings for $25. For more information on these programs, visit: www.forestnursery.org or call (732) 928-0029.